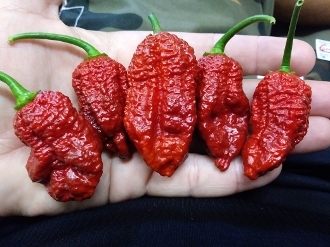 This listing is for ONE (1) pack of Bhutlah BubbleGum 7 Pot Chocolate Seeds! Each pack contains 20+ seeds. This variety will grow from seed to harvest in approx 175 days. The peppers will mature from Green to Chocolate/Brown in color. The Chocolate/Brown varieties are GREAT for making BBQ sauce or dehydrating and turning them into powder for BBQ rubs and seasonings!! Order some and try your hand at growing them in your garden!! The Internet is a GREAT tool for finding more specific info on ANY given variety of pepper we grow. We also have more pictures of each variety we grow on our Facebook page as well. Stop by and give us a "Like"... we also offer special deals and coupon codes strictly for our Facebook fans! :) Check it out! !